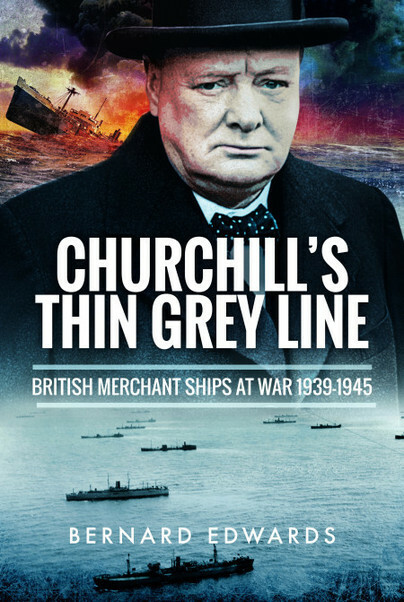 You'll be £8.00 closer to your next £10.00 credit when you purchase Churchill's Thin Grey Line. What's this? The first British casualties of the Second World War were not members of either the Royal Navy, the Army or the Royal Air Force but British merchant seamen on the liner Athenia, torpedoed by U-30 on 3 September 1939. For the duration of the War Britain’s merchant fleet performed a vital role, carrying the essential supplies that kept the country running during the darkest days and then made victory possible. Their achievements came at a terrible cost with 2,535 British ocean-going merchant ships being sunk and, of the 185,000 men and women serving in the British Merchant Navy at the time, 36,749 sacrificed their lives. A further 4,707 were wounded and 5,720 ended up in prisoner of war camps. Their casualty rate of 25 percent was second only to RAF Bomber Command’s. Using casebook examples, this well researched book tells the inspiring story of those brave civilian volunteers who fought so gallantly to defend their ships and the cargoes. An eight-page section of black-and-white photographs illustrates this 235-page book's diligently researched stories of valiant civilians who fought to protect their ships and cargoes to help the U.K war effort. Another brilliant book by a retired sea captain and master wordsmith who recreates the past as though we were there among the frantic nautical action. Nobody does it better. A cracking read which brings home to the reader how much we in this country owe to the Merchant Navy. These are stories which deserve to be re-told, and Bernard Edwards powerfully reminds us that they contain lessons that remain relevant today. The volume is both well-written and informative... a worthy example of its ‘War Story’ genre. First-rate book, with carefully chosen examples of the craft, cargoes, crews, and the dangers they faced constantly while trying to keep Britain and her allies supplied with essentials. Grippingly readable and very well researched, every story is worthy of a war drama - but this was reality. A highly recommended read for a true understanding of some of the sacrifices made by non-military services during World War II, largely overlooked at the time and since. To paraphrase Churchill, never have so many been acknowledged by so few; this book rectifies that. Bernard Edwards pursued a sea-going career commanding ships trading worldwide. After nearly forty years afloat. Captain Edwards settled in a tiny village in rural South Wales, to pursue his second career as a writer. His extensive knowledge of the sea and ships has enabled him to produce many authentic and eminently readable books which have received international recognition. Beware Raiders!, Attack and Sink!, The Cruel Sea Retold, The Quiet Heroes, Twilight of the U-Boats, Death in the Doldrums, The Road to Russia, The Wolf Packs Gather, The Decoys and U-boats Beyond Biscay have been published by Pen and Sword Books.